One of the bacterial diseases with the highest disease burden is tuberculosis, caused by Mycobacterium tuberculosis bacteria, which kills about 2 million people a year, mostly in sub-Saharan Africa. Pathogenic bacteria contribute to other globally important diseases, such as pneumonia, which can be caused by bacteria such as Streptococcus and Pseudomonas, and foodborne illnesses, which can be caused by bacteria such as Shigella, Campylobacter, and Salmonella. Pathogenic bacteria also cause infections such as tetanus, typhoid fever, diphtheria, syphilis, and leprosy. Pathogenic bacteria are also the cause of high infant mortality rates in developing countries. Streptococcus and Staphylococcus are part of the normal skin microbiota and typically reside on healthy skin or in the nasopharangeal region. Yet these species can potentially initiate skin infections. They are also able to cause sepsis, pneumonia or meningitis. These infections can become quite serious creating a systemic inflammatory response resulting in massive vasodilation, shock, and death. Other bacteria are opportunistic pathogens and cause disease mainly in people suffering from immunosuppression or cystic fibrosis. Examples of these opportunistic pathogens include Pseudomonas aeruginosa, Burkholderia cenocepacia, and Mycobacterium avium. Chlamydia is a phylum of intracellular parasites. These pathogens can cause pneumonia or urinary tract infection and may be involved in coronary heart disease. Other groups of intracellular bacterial pathogens include Salmonella, Neisseria, Brucella, Mycobacterium, Nocardia, Listeria, Francisella, Legionella, and Yersinia pestis. These can exist intracellularly, but can exist outside of host cells. Other non-bacterial vaginal infections include: yeast infection (candidiasis), Trichomonas vaginalis (trichomoniasis). Urinary tract infection is predominantly caused by bacteria. Symptoms include the strong and frequent sensation or urge to urinate, pain during urination, and urine that is cloudy. The main causal agent is Escherichia coli. Urine is typically sterile but contains a variety of salts, and waste products. Bacteria can ascend into the bladder or kidney and causing cystitis and nephritis. Bacterial gastroenteritis is caused by enteric, pathogenic bacteria. These pathogenic species are usually distinct from the usually harmless bacteria of the normal gut flora. But a different strain of the same species may be pathogenic. The distinction is sometimes difficult as in the case of Escherichia. Impetigo is a highly contagious bacterial skin infection commonly seen in children. It is caused by Staphylococcus aureus, and Streptococcus pyogenes. Erysipelas is an acute streptococcus bacterial infection of the deeper skin layers that spreads via with lymphatic system. Cellulitis is a diffuse inflammation of connective tissue with severe inflammation of dermal and subcutaneous layers of the skin. Cellulitis can be caused by normal skin flora or by contagious contact, and usually occurs through open skin, cuts, blisters, cracks in the skin, insect bites, animal bites, burns, surgical wounds, intravenous drug injection, or sites of intravenous catheter insertion. In most cases it is the skin on the face or lower legs that is affected, though cellulitis can occur in other tissues. The symptoms of disease appear as pathogenic bacteria damage host tissues or interfere with their function. The bacteria can damage host cells directly. They can also cause damage indirectly by provoking an immune response that inadvertently damages host cells. Once pathogens attach to host cells, they can cause direct damage as the pathogens use the host cell for nutrients and produce waste products. For example, Streptococcus mutans, a component of dental plaque, metabolizes dietary sugar and produces acid as a waste product. The acid decalcifies the tooth surface to cause dental caries. However, toxins produced by bacteria cause most of the direct damage to host cells. 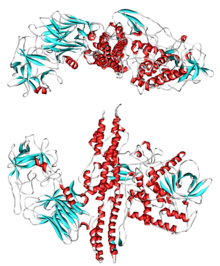 Endotoxins are the lipid portions of lipopolysaccharides that are part of the outer membrane of the cell wall of gram negative bacteria. Endotoxins are released when the bacteria lyses, which is why after antibiotic treatment, symptoms can worsen at first as the bacteria are killed and they release their endotoxins. Exotoxins are secreted into the surrounding medium or released when the bacteria die and the cell wall breaks apart. An excessive or inappropriate immune response triggered by an infection may damage host cells. Iron is required for humans, as well as the growth of most bacteria. To obtain free iron, some pathogens secrete proteins called siderophores, which take the iron away from iron-transport proteins by binding to the iron even more tightly. Once the iron-siderophore complex is formed, it is taken up by siderophore receptors on the bacterial surface and then that iron is brought into the bacterium. Typically identification is done by growing the organism in a wide range of cultures which can take up to 48 hours. The growth is then visually or genomically identified. The cultured organism is then subjected to various assays to observe reactions to help further identify species and strain. Bacterial infections may be treated with antibiotics, which are classified as bacteriocidal if they kill bacteria or bacteriostatic if they just prevent bacterial growth. There are many types of antibiotics and each class inhibits a process that is different in the pathogen from that found in the host. For example, the antibiotics chloramphenicol and tetracyclin inhibit the bacterial ribosome but not the structurally different eukaryotic ribosome, so they exhibit selective toxicity. Antibiotics are used both in treating human disease and in intensive farming to promote animal growth. Both uses may be contributing to the rapid development of antibiotic resistance in bacterial populations. Phage therapy can also be used to treat certain bacterial infections. Anthrax: pulmonary, gastrointestinal and/or cutaneous symptoms. Contact with respiratory droplets expelled by infected human hosts. Wearing clothing that limits skin exposure to ticks. Avoid areas where ticks are found. Diphtheria: Fever, sore throat and neck swelling, potentially narrowing airways. Tularemia: Fever, ulceration at entry site and/or lymphadenopathy. Can cause severe pneumonia. Mouth, skin, and gut flora. Food and water contaminated by urine from infected wild or domestic animals. Leptospira survives for weeks in fresh water and moist soil. Leptospirosis: Headaches, muscle pains, and fevers; possible jaundice, kidney failure, pulmonary hemorrhage, and meningitis. Leprosy (Hansen's disease): granulomas of the nerves, respiratory tract, skin, and eyes. Syphilis: First a chancre, (a painless skin ulceration), then diffuse rash. Later: gummas (soft growths), neurological, or heart symptoms. Of the 59 species listed in the table with their clinical characteristics, 11 species (or 19%) are known to be capable of natural genetic transformation. Natural transformation is a bacterial adaptation for transferring DNA from one cell to another. This process includes the uptake of exogenous DNA from a donor cell by a recipient cell and its incorporation into the recipient cell’s genome by recombination. Transformation appears to be an adaptation for repairing damage in the recipient cell’s DNA. Among pathogenic bacteria, transformation capability likely serves as an adaptation that facilitates survival and infectivity. The pathogenic bacteria able to carry out natural genetic transformation (of those listed in the table) are Campylobacter jejuni, Enterococcus faecalis, Haemophilus influenzae, Helicobacter pylori, Klebsiella pneumoniae, Legionella pneumophila, Neisseria gonorrhoeae, Neisseria meningitides, Staphylococcus aureus, Streptococcus pneumoniae and Vibrio cholerae. ^ Relapsing fever can also be caused by the following Borrelia species: B. crocidurae, B. duttonii, B. hermsii, B. hispanica, B. miyamotoi, B. persica, B. turicatae and B. venezuelensis. - Barbour, Alan G. (2017). "Relapsing Fever". In Kasper, Dennis L.; Fauci, Anthony S. (eds.). Harrison's Infectious Diseases (3rd ed.). New York: McGraw Hill Education. pp. 678–687. ISBN 978-1-259-83597-1. ^ a b Ryan, Kenneth J.; Ray, C. George; Ahmad, Nafees; Drew, W. Lawrence; Lagunoff, Michael; Pottinger, Paul; Reller, L. Barth; Sterling, Charles R. (2014). "Pathogenesis of Bacterial Infections". Sherris Medical Microbiology (6th ed.). New York: McGraw Hill Education. pp. 391–406. ISBN 978-0-07-181826-1. ^ McFall-Ngai, Margaret (2007-01-11). "Adaptive Immunity: Care for the community". Nature. 445 (7124): 153. doi:10.1038/445153a. ISSN 0028-0836. PMID 17215830. ^ a b c d Santosham, Mathuram; Chan, Grace J.; Lee, Anne CC; Baqui, Abdullah H.; Tan, Jingwen; Black, Robert E. (2013). "Risk of Early-Onset Neonatal Infection with Maternal Infection or Colonization: A Global Systematic Review and Meta-Analysis". PLoS Medicine. 10 (8): e1001502. doi:10.1371/journal.pmed.1001502. ISSN 1549-1676. PMC 3747995. PMID 23976885. ^ Fish DN (February 2002). "Optimal antimicrobial therapy for sepsis". Am J Health Syst Pharm. 59 (Suppl 1): S13–9. doi:10.1093/ajhp/59.suppl_1.S13. PMID 11885408. ^ Heise E (1982). "Diseases associated with immunosuppression". Environ Health Perspect. 43: 9–19. doi:10.2307/3429162. JSTOR 3429162. PMC 1568899. PMID 7037390. ^ Saiman L (2004). "Microbiology of early CF lung disease". Paediatr Respir Rev. 5 (Suppl A): S367–9. doi:10.1016/S1526-0542(04)90065-6. PMID 14980298. ^ Belland R, Ouellette S, Gieffers J, Byrne G (2004). "Chlamydia pneumoniae and atherosclerosis". Cell Microbiol. 6 (2): 117–27. doi:10.1046/j.1462-5822.2003.00352.x. PMID 14706098. ^ Terri Warren, RN (2010). "Is It a Yeast Infection?". Retrieved 2011-02-23. ^ "Urinary Tract Infections". Retrieved 2010-02-04. ^ "Adult Health Advisor 2005.4: Bacteria in Urine, No Symptoms (Asymptomatic Bacteriuria)". Archived from the original on 2007-07-12. Retrieved 2007-08-25. ^ Greenwood, David; Barer, Mike; Slack, Richard; Irving, Will (2012). "Bacterial Pathogenicity". Medical Microbiology, a Guide to Microbial Infections: Pathogenesis, Immunity, Laboratory Investigation, and Control (18th ed.). Edinburgh: Churchill Livingstone. pp. 156–167. ISBN 9780702040894. ^ a b Tortora, Gerald J.; Funke, Berdell R.; Case, Christine L. (2016). "Microbial Mechanisms of Pathogenicity". Microbiology, an Introduction (12th ed.). Pearson Education. pp. 417–438. ISBN 978-0-321-92915-0. ^ Nash, Anthony A.; Dalziel, Robert G.; Fitzgerald, J. Ross (2015). "Mechanisms of Cell and Tissue Damage". Mims' Pathogenesis of Infectious Disease (6th ed.). London: Academic Press. pp. 171–231. ISBN 978-0-12-397188-3. ^ a b Tortota, Gerard (2013). Microbiology an Introduction. ISBN 978-0-321-73360-3. ^ Cassells AC (2012). Pathogen and biological contamination management in plant tissue culture: phytopathogens, vitro pathogens, and vitro pests. Methods in Molecular Biology. 877. pp. 57–80. doi:10.1007/978-1-61779-818-4_6. ISBN 978-1-61779-817-7. PMID 22610620. ^ Yonath A, Bashan A (2004). "Ribosomal crystallography: initiation, peptide bond formation, and amino acid polymerization are hampered by antibiotics". Annu Rev Microbiol. 58: 233–51. doi:10.1146/annurev.micro.58.030603.123822. PMID 15487937. ^ a b c d e f g h i j k l m n o p q r Unless else specified in boxes then ref is: Fisher, Bruce; Harvey, Richard P.; Champe, Pamela C. (2007). Lippincott's Illustrated Reviews: Microbiology (Lippincott's Illustrated Reviews Series). Hagerstown, MD: Lippincott Williams & Wilkins. pp. 332–353. ISBN 978-0-7817-8215-9. ^ Kurzynski TA, Boehm DM, Rott-Petri JA, Schell RF, Allison PE (1988). "Comparison of modified Bordet-Gengou and modified Regan-Lowe media for the isolation of Bordetella pertussis and Bordetella parapertussis". J. Clin. Microbiol. 26 (12): 2661–3. PMC 266968. PMID 2906642. ^ a b c d e f g h i j k l m n o p q r s t u v w x y z aa ab ac ad ae af ag ah ai aj ak al am an ao ap aq ar as at au av aw ax ay az ba bb bc bd be bf bg bh bi bj bk bl bm bn bo bp bq br bs bt bu bv bw bx by bz ca cb cc cd ce cf cg ch ci cj ck cl cm cn co cp cq cr cs ct cu cv cw cx cy cz da db dc dd de df dg dh di dj dk dl dm dn do dp dq dr ds dt du dv dw dx dy dz ea eb ec ed ee ef eg eh ei ej ek el em en eo ep eq er es et eu ev ew ex ey ez fa fb fc fd fe ff fg fh fi fj fk fl fm fn fo fp fq fr fs ft fu fv fw fx fy fz ga gb gc gd ge gf gg gh gi gj gk gl gm gn go gp gq gr gs gt gu gv gw gx gy gz ha hb hc hd he hf hg hh hi hj hk hl hm hn ho hp hq hr hs ht hu hv hw hx hy hz ia ib ic id ie if ig ih ii ij ik il im in io ip iq ir is it iu iv iw ix iy iz ja jb jc jd je jf jg jh ji jj jk jl jm jn jo jp jq jr js jt ju jv jw jx jy jz ka kb kc kd ke kf kg kh ki kj kk kl km kn ko kp kq kr ks kt Fisher, Bruce; Harvey, Richard P.; Champe, Pamela C. (2007). Lippincott's Illustrated Reviews: Microbiology (Lippincott's Illustrated Reviews Series). Hagerstown, MD: Lippincott Williams & Wilkins. pp. 332–353. ISBN 978-0-7817-8215-9. ^ a b c Epps SV, Harvey RB, Hume ME, Phillips TD, Anderson RC, Nisbet DJ (2013). "Foodborne Campylobacter: infections, metabolism, pathogenesis and reservoirs". International Journal of Environmental Research and Public Health. 10 (12): 6292–304. doi:10.3390/ijerph10126292. PMC 3881114. PMID 24287853. ^ Baron, Samuel (1996). Medical Microbiology (4th ed.). University of Texas Medical Branch at Galveston, Galveston, Texas. ISBN 978-0-9631172-1-2. ^ Rollins, David M. (2000). "BSCI424 Laboratory Media". University of Maryland. Retrieved 2008-11-18. ^ Cain, Donna (January 14, 2015). "MacConkey Agar (CCCCD Microbiology". Collin College. ^ Gunn BA (1984). "Chocolate agar, a differential medium for gram-positive cocci". Journal of Clinical Microbiology. 20 (4): 822–3. PMC 271442. PMID 6490866. ^ Stevenson TH, Castillo A, Lucia LM, Acuff GR (2000). "Growth of Helicobacter pylori in various liquid and plating media". Lett. Appl. Microbiol. 30 (3): 192–6. doi:10.1046/j.1472-765x.2000.00699.x. PMID 10747249. ^ Johnson RC, Harris VG (1967). "Differentiation of Pathogenic and Saprophytic Leptospires I. Growth at Low Temperatures". J. Bacteriol. 94 (1): 27–31. PMC 251866. PMID 6027998. ^ "Thayer Martin Agar (Modified) Procedure" (PDF). University of Nebraska-Medical Center, Clinical Laboratory Science Program. Retrieved 2015-05-03. ^ "Hektoen Enteric Agar". Austin Community College District. Retrieved 2015-05-03. ^ Cassell GH, Waites KB, Crouse DT, Rudd PT, Canupp KC, Stagno S, Cutter GR (1988). "Association of Ureaplasma urealyticum infection of the lower respiratory tract with chronic lung disease and death in very-low-birth-weight infants". Lancet. 2 (8605): 240–5. doi:10.1016/s0140-6736(88)92536-6. PMID 2899235. ^ Pfeffer, C.; Oliver, J.D. (2003). "A comparison of thiosulphate-citrate-bile salts-sucrose (TCBS) agar and thiosulphate-chloride-iodide (TCI) agar for the isolation of Vibrio species from estuarine environments". Letters in Applied Microbiology. 36 (3): 150–151. doi:10.1046/j.1472-765X.2003.01280.x. PMID 12581373. ^ "Yersinia pestis" (PDF). Wadsworth Center. 2006. ^ a b c d e f g h i j k l m n o p q r s t u v w x y z aa ab ac ad ae af ag ah ai aj ak al am an ao ap aq ar as at au av aw ax ay az ba bb bc bd be bf bg bh bi bj bk bl bm bn bo bp bq br bs bt bu bv bw bx by bz ca cb cc cd ce cf cg ch ci cj ck cl cm cn co cp cq cr cs ct cu cv cw cx cy cz da db dc dd de df dg dh di dj dk dl dm dn do dp dq dr ds dt du dv dw dx dy dz ea eb ec ed ee ef eg eh ei ej ek el em en eo ep eq er es et eu ev ew ex ey ez fa fb fc fd fe ff fg fh fi fj fk fl fm fn fo fp fq fr fs ft fu fv fw fx fy fz ga gb gc gd ge gf gg gh gi gj gk gl gm gn go gp gq gr gs gt gu gv gw gx gy gz ha hb hc hd he hf hg "Bacteria Table" (PDF). Creighton University School of Medicine. Archived from the original (PDF) on 2015-05-01. Retrieved 2015-05-03. ^ Mabeza, GF; Macfarlane J (March 2003). "Pulmonary actinomycosis". European Respiratory Journal. 21 (3): 545–551. doi:10.1183/09031936.03.00089103. PMID 12662015. ^ "Anthrax in animals". Food and Agriculture Organization. 2001. ^ "CDC Anthrax Q & A: Treatment". Retrieved 4 April 2011. ^ "FDA approves raxibacumab to treat inhalational anthrax". Retrieved 14 December 2012. ^ a b Itzhak Brook (Jan 28, 2014). "Bacteroides Infection Follow-up". Medscape. Retrieved 2015-09-25. ^ Shapiro ED (2014). "Clinical practice. Lyme disease". The New England Journal of Medicine. 370 (18): 1724–31. doi:10.1056/NEJMcp1314325. PMC 4487875. PMID 24785207. ^ a b Sanchez JL (2015). "Clinical Manifestations and Treatment of Lyme Disease". Clinics in Laboratory Medicine. 35 (4): 765–78. doi:10.1016/j.cll.2015.08.004. PMID 26593256. ^ Halperin JJ (2015). "Nervous System Lyme Disease". Clinics in Laboratory Medicine. 35 (4): 779–95. doi:10.1016/j.cll.2015.07.002. PMID 26593257. ^ a b c d e f Barbour, Alan G. (2017). "Relapsing Fever". In Kasper, Dennis L.; Fauci, Anthony S. (eds.). Harrison's Infectious Diseases (3rd ed.). New York: McGraw Hill Education. pp. 678–687. ISBN 978-1-259-83597-1. ^ Cutler SJ (2015). "Relapsing Fever Borreliae: A Global Review". Clinics in Laboratory Medicine. 35 (4): 847–65. doi:10.1016/j.cll.2015.07.001. PMID 26593261. ^ Atkinson, William (May 2012). Tetanus Epidemiology and Prevention of Vaccine-Preventable Diseases (12 ed.). Public Health Foundation. pp. 291–300. ISBN 9780983263135. Archived from the original on 13 February 2015. Retrieved 12 February 2015. ^ "Diphtheria vaccine" (PDF). Wkly Epidemiol Rec. 81 (3): 24–32. 20 January 2006. PMID 16671240. Archived (PDF) from the original on 6 June 2015. ^ "ESCHERICHIA COLI". Public Health Agency of Canada. 2012-04-30. Retrieved 2015-06-02. ^ Ryan, KJ; Ray, CG, eds. (2004). Sherris Medical Microbiology (4th ed.). McGraw Hill. ISBN 978-0-8385-8529-0. ^ Slack, A (Jul 2010). "Leptospirosis". Australian Family Physician. 39 (7): 495–8. PMID 20628664. ^ McBride, AJ; Athanazio, DA; Reis, MG; Ko, AI (Oct 2005). "Leptospirosis". Current Opinion in Infectious Diseases. 18 (5): 376–86. doi:10.1097/01.qco.0000178824.05715.2c. PMID 16148523. ^ a b Hartskeerl, Rudy A.; Wagenaar, Jiri F.P. (2017). "Leptospirosis". In Kasper, Dennis L.; Fauci, Anthony S. (eds.). Harrison's Infectious Diseases. New York: McGraw Hill Education. pp. 672–678. ISBN 978-1-259-83597-1. ^ "Leprosy Fact sheet N°101". World Health Organization. January 2014. Archived from the original on 2013-12-12. ^ "Tuberculosis Fact sheet N°104". WHO. October 2015. Archived from the original on 23 August 2012. Retrieved 11 February 2016. ^ Levinson, W. (2010). Review of Medical Microbiology and Immunology (11th ed.). pp. 94–9. ^ "Syphilis - CDC Fact Sheet (Detailed)". CDC. 2 November 2015. Archived from the original on 6 February 2016. Retrieved 3 February 2016. ^ Kent ME, Romanelli F (February 2008). "Reexamining syphilis: an update on epidemiology, clinical manifestations, and management". Annals of Pharmacotherapy. 42 (2): 226–36. doi:10.1345/aph.1K086. PMID 18212261. ^ Hook EW (2017). "Syphilis". Lancet. 389 (10078): 1550–1557. doi:10.1016/S0140-6736(16)32411-4. PMID 27993382. ^ Zhou D, Han Y, Yang R (2006). "Molecular and physiological insights into plague transmission, virulence and etiology". Microbes Infect. 8 (1): 273–84. doi:10.1016/j.micinf.2005.06.006. PMID 16182593. ^ Wagle PM. (1948). "Recent advances in the treatment of bubonic plague". Indian J Med Sci. 2: 489–94. ^ Meyer KF. (1950). "Modern therapy of plague". JAMA. 144 (12): 982–5. doi:10.1001/jama.1950.02920120006003. PMID 14774219. ^ Kilonzo BS, Makundi RH, Mbise TJ (1992). "A decade of plague epidemiology and control in the Western Usambara mountains, north-east Tanzania". Acta Tropica. 50 (4): 323–9. doi:10.1016/0001-706X(92)90067-8. PMID 1356303. ^ Bubeck SS, Dube PH (September 2007). "Yersinia pestis CO92ΔyopH Is a Potent Live, Attenuated Plague Vaccine". Clin. Vaccine Immunol. 14 (9): 1235–8. doi:10.1128/CVI.00137-07. PMC 2043315. PMID 17652523.